Everyone I met was professional, friendly,polite and helpful. Especially the sales consultant Arthur Khachikyan. I have purchased a few new vehicles before, and have never really felt at ease with the experience.It seemed to create a degree of anxiety that made me feel as if I should always be on my guard during this whole process. 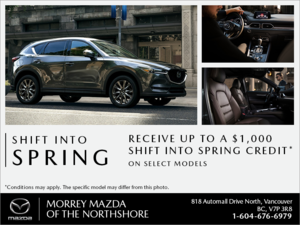 This was definitely not the case at Northshore Morrey Mazda. Everyone I met was professional, friendly,polite and helpful. Especially the sales consultant Arthur Khachikyan. I am most grateful for his patience during the numerous test drives I took with him before making my decision on the CX5. Thanks to everyone for making it a little easier to sign my cheque. Everyone with whom we dealt with at the Dealership provided excellent and professional assistance to do with the purchase of the 2019 CX3 GT. Justin Erb was extremely professional and easy to deal with.